University Council member Helen Quigley. Mrs Helen Quigley is a Fellow of the Institute of Accounting Technicians. Having worked in an accountancy practice in Derry for 30 years, Helen is a former Councillor and Mayor of Derry (2006 – 07) and served as President of the Northern Ireland Local Government Association (NILGA) in 2008 – 09. 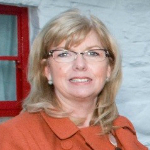 As a Public Representative, Helen held various positions both on Derry City Council and outside bodies. Helen is currently Chief Executive Officer with Inner City Trust, Derry and sits on the board of the Development Trusts Northern Ireland. Helen is also a member of Urban Academy and sits on the steering group of Headliners (youth media group). She is currently Acting Chair of the charity Action with Effect. Married to Vincent, she is also Vice Captain of the North West Golf Club.